The Pleven Philharmonic was establish in 1953 from the famous bulgarian conductor and violinist – maestro Sasha Popov. The improvement of the orchestra in next 62 years was result of hard work with the most famous Bulgarian conductors as Nicola Kazasov, Stefan Vrachev, Dragomir Nenov, Aleksander Vladigerov, Ivan Bakalov, Emil Yanev, Vladi Atanasov, Dimitar Karagiozov, Kamen Goleminov, Dimtar Manolov , also Dobrin Petkov, Konstantin Iliev, Ruslan Raichev, Ivan Marinov, Vasil Kazandjiev, Emil Tabakov. In the period 1970 1994, the orchestra participated in the production of Pleven Opera Theater with more than 50 opera and ballet works. The chief conductor for more than 30 years of Pleven philharmony was maestro George Notev. Under his baton the orchestra performed with numerous bulgarian and international soloists, supplied to the audience many premier symphony works. The repertoire of Pleven philharmony includes all styles from barock to cotemporary compositions. also opera productions and new symphonic premiere. As a guests conductors on the stage of the orchestra have worked world famous conductors from Europe, Asia and America like Vladimir Kozhuhar, Konstantin Orbelyan, Boguslaw Dawidow, Olivie Olt, Ekart Proy, Yuri Yanko, etc. 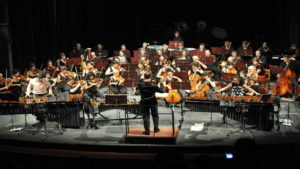 The orchestra has done a number of international tours, at a high artistic level in Italy, Spain, Czech Republik, Greece, Romania, Austria, France, Belgium, Spain, Norway, Finland, Portugal and others. It possesses recordings in the Golden Fund of the Bulgarian National Radio, Television, as well as recordings of LPs and CDs for different companies from Europe. The Pleven philharmony regularly participate in international festivals “Sofia Music Weeks”, “Apolonia”, “Varna Summer” , “New Bulgarian Music”, etc. The orchestra is the initiator and host of the international festival “Laureat Days Katya Popova”, playing together with the young and talented instrumentalists and singers from all around the world. Next year – 2016 the festival has 50 years Anniversary . In 2006 Pleven philharmony establish national competition for singers, dedicated to the great soprano Gena Dimitrova.